Get With the Program—or Get out of the Way. I had to pull them free to line up the 2 pieces, center front to center front. 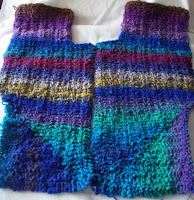 And being philisophical about it—the stripes don't match—but that is way things are--Noro doesn't match up. The colors are nice, and blend nicely from one to the other, and all sorts of other nice things can be said. When the miter is done, I think I am going to pick up a few stitches on the side and make the side panel deeper. 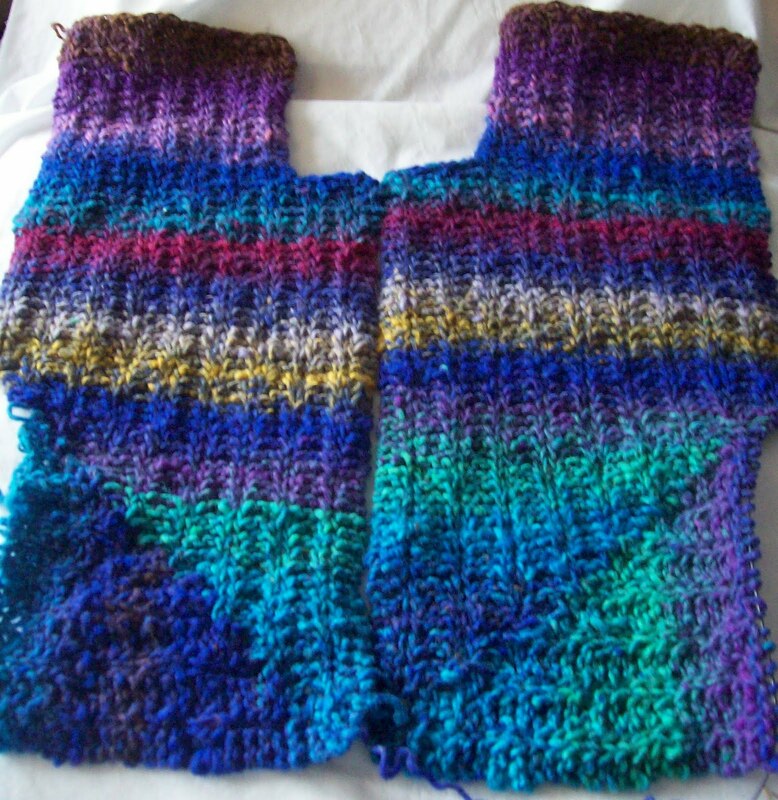 The back will be a mirror image of the front—worked with 2 balls of yarns, a miter and interlocked “seam” at the center back. I am pleased with the striped garter stitch—a strong, and at the same time subtle Vertical to counter the horizontal color stripe. It's moving along nicely—which is good! But the non matching stripes means this vest will never be a show off one--rather an around the house, or under the coat warmer. Tomorrow, I will cast on another pair of socks—Red, white and shades of grey—is the most likely contender.. but maybe, by tomorrow, I will have changed my mind! Cousin A was pleased with her fingerless gloves—and all is right with the world.